Last week, we were in Anaheim, Calif., to participate in the 2012 National Recreation & Park Association (NRPA) Congress & Exposition. 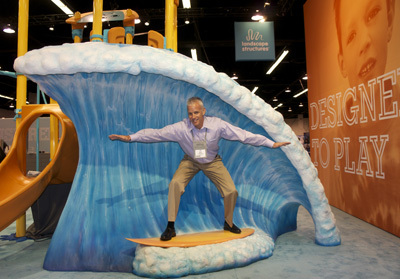 We exhibited with a beach-themed booth design, which featured the PlayBooster® Vibe™ and a 6-foot ocean wave sculpted from concrete. Visitors to our booth got a chance to meet some of our custom designers and artists, as well as participate in mock design sessions. Attendees were encourages to put their creativity to work to create a personalized t-shirt. See photos of inspiring t-shirts on Facebook, and tell us what you’re “designed to” do. On Wednesday, Oct. 17, we hosted a reception on the 5th Floor Lanai at the Hilton Hotel Anaheim. It was a gorgeous evening in a gorgeous space, and we welcomed more than 400 people to the event. In addition to cocktails, hors d’oeuvres and fun, we also celebrated the NRPA Award Winners including the recipient of the Barb King Award for Environmental Stewardship—the County of San Diego, Department of Parks and Recreation. The award was created for Barb King (1946-2008), who cofounded Landscape Structures with her husband, Steve King, to honor her passion for environmental stewardship and sustainability. We had a great three days in Anaheim visiting with park and recreation professionals, hearing from industry experts and taking in the nearby attractions. 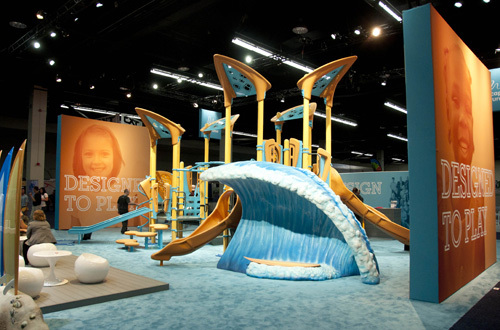 Our employees and playground consultants are already looking forward to 2013 NRPA in Houston, Texas! This entry was posted in Custom, Design, Park and Recreation, Play, Sustainability and tagged Barb King, Environmental Stewardship, NRPA by PlayLSI. Bookmark the permalink.